Math class can be difficult for anybody. 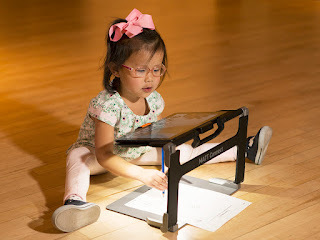 Even sighted students need to use special tools and techniques to help them translate information on a page into an internal visualization. For blind and visually impaired students, these tools and techniques are just a little different. Math Window consists of a magnetic board and tiles that allow blind students to build and solve math problems. The tiles combine printed numerals and symbols for the sighted instructor, along with Nemeth Code for the blind student. Math problems can be configured in the same linear or vertical forms that sighted students are taught. Blind students can participate and understand math concepts along with their sighted peers. This would be a great teaching aid in the mainstream environment. Math problems are constructed by quickly sliding the appropriate tiles from the perimeter storage area to the central work area. The problem-solving process is identical to that used by sighted students, so blind students can learn and participate in the mainstream classroom. Click this link to learn more about the Math Window from its website.